Select one or more items to perform different actions. The Copy here window is displayed. 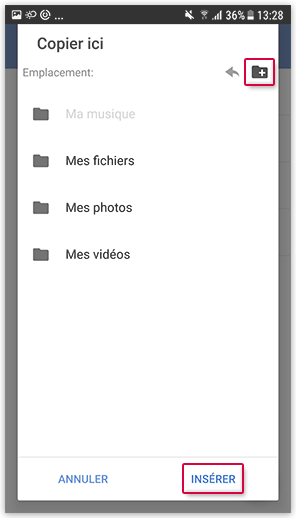 Choose an existing folder by selecting it and tapping Insert (a). 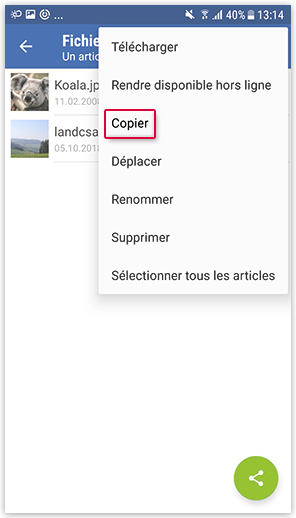 Create a new folder by tapping the new folder symbol (b), enter a name and confirm with OK. The Move here window is displayed. Select an element by tapping the box right next to the element. The Rename window is displayed. Enter a new name and confirm with OK. The elements are moved to the trash and are not irretrievably deleted. Elements can be moved back to another folder from the trash.